VASI’s online campaign to help the Peruvian Amazonian region closes this month. With a target of over $110,000, the non-profit’s goal is to empower communities by absolving poverty and enriching the overall lives of the community through education and by establishing business relationships with chocolatiers through their agroforestry project. Visión Amazónica para la Sostenibilidad Integral (VASI) is continuing to look for support through their Indiegogo campaign this month. 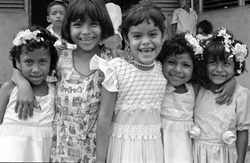 The non-profit has a goal of $110,791 that will directly impact the well-being of Peruvian Amazonian communities. The project aims to help communities in the Amazon build business opportunities with the production of fine chocolate, provide access to higher education and develop community driven scientific research to maintain the biodiversity in the area. The online portion of the funding campaign ends this month. The Amazon is known as one of the most important regions on the planet in terms of biodiversity, fresh water and contains more that 20% of the Earth’s oxygen. It is also home to rural communities that have lived in this area for thousands of years. Currently they face extreme poverty, deforestation and lack of education and access to new business opportunities. As the rainforests are destroyed so is the livelihood of this region. Together nine communities, university students and scientists have created a multi-pronged approach to directly address these challenges. VASI’s goal is to contribute to the conservation and sustainability of the Peruvian Amazon through business opportunities, higher education and scientific information. They plan to build direct trade agreements with craft chocolate makers, chefs and others is the United States and globally. They have established connections with several craft chocolate makers in Michigan and also presently securing business relationships with specialty food providers. VASI has already developed partnerships with several craft chocolatiers in Michigan and with Good Stuff Cacao.